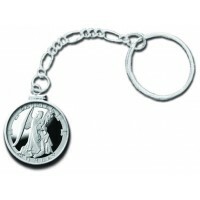 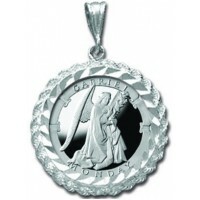 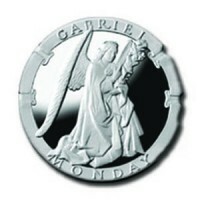 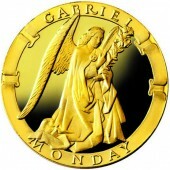 Gabriel is the Angel of the Annunciation of the Madonna, Resurrection of Christ, Mercy, Vengeance, Death, and Revelation. 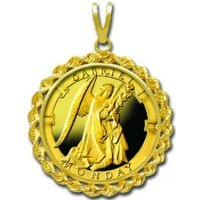 This Chief of the Angelic Guards was placed as guardian of Paradise, and ruler of Monday, the day of the Moon. 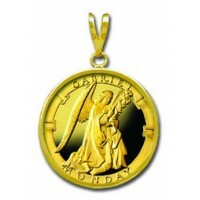 Our intentions on Monday and the hour of the moon should involve Psychological Balance, Beauty, Psychic Abilities, Feminine Forces, Dreams, Astral Travel, Protection, and Intuition. 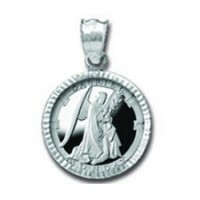 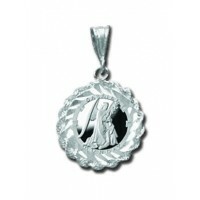 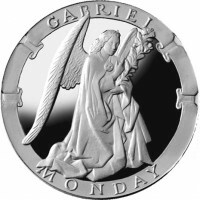 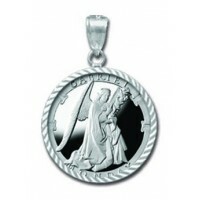 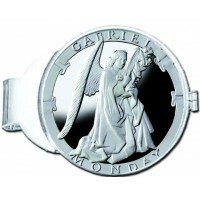 "Gabriel holds the Lily flower sybolizing new life, His pendant is the sign of the Moon." 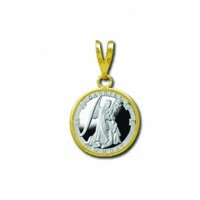 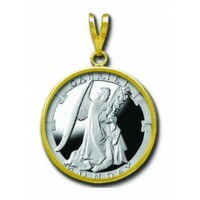 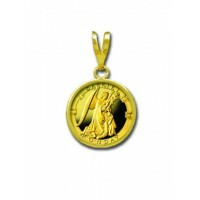 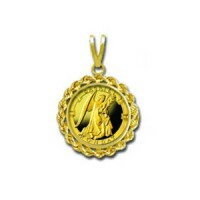 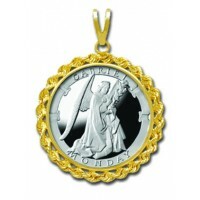 1/20 oz 0.9999 Gold Medallion Pendant w/ 14k Plain Bezel Medallion Size: .55 " diameter ..
1/20 oz 0.9999 Gold Medallion Pendant w/ 14k Rope Bezel Medallion Size: .55 " diameter ..
1/20 oz 0.999 Silver Medallion w/ Sterling Silver Diamond-Cut Rope Bezel Medallion Size: .55 " dia..
1/20 oz 0.999 Silver Medallion w/ Sterling Silver Ribbon-Cut Bezel Medallion Size: 0.55 " diameter..
1/20 oz 0.999 Silver Medallion Pendant w/ 14k Gold Rope Bezel Medallion Size: 0.55" diameter ..
1/20 oz 0.999 Silver Medallion Pendant w/ 14k Gold Plain Bezel Medallion Size: 0.55" diameter ..
1/4 oz 0.9999 Gold Medallion Pendant w/ 14k Rope Bezel Medallion Size: 7/8" diameter ..
1/4 oz 0.9999 Gold Medallion Pendant w/ 14k Plain Bezel Medallion Size: 7/8" diameter ..
1/4 oz 0.999 Silver Medallion w/ Sterling Silver Ribbon-Cut Bezel Medallion Size: 7/8" diameter ..
1/4 oz 0.999 Silver Medallion w/ Sterling Silver Diamond-Cut Rope Bezel Medallion Size: 7/8" diame..
1/4 oz 0.999 Silver Medallion Pendant w/ 14k Gold Rope Bezel Medallion Size: 7/8" diameter ..
1/4 oz 0.999 Silver Medallion Pendant w/ 14k Gold Plain Bezel Medallion Size: 7/8" diameter ..
1/4 oz 0.999 Silver Pocket Angels Medallion Medallion Size: 7/8" diameter ..
Collector's Limited Edition 1 oz Silver Medallion in a Specially Sealed Coin Holder Medallion Size..
1/4 oz Silver Medallion Key Chain Medallion Size: 7/8 " diameter ..
1 oz Silver Medallion Money Clip Medallion Size: 1 1/2 " diameter ..